-Book of the Banned: These books can create secret pages 1/day; furthermore, mythic wizards may inscribe spells of their opposition school on said pages by expending 1 mythic power per level level, 1 for cantrips. Thereafter, the wizard can prepare the spell as though it didn’t belong to the opposition school. Solid! -Bullroarer’s Bugle: Horn of pursuit with dual bless/bane effect. Halflings get higher bonuses and the user may opt to penalize only one type of humanoid, who then receives a more significant drawback. the formatting glitch that shows a strike-through box instead of a minus-sign is here, but that’s a cosmetic glitch. In the hands of a mythic character, longstrider or, for halflings, expeditious retreat is applied as well. The sounder of the horn may also expend mythic power to instead bestow the mythic versions of horn of pursuit/bless/bane or power additional uses per day via mythic power. Per se pretty cool, but can the narrowing of the bane effect to one humanoid and the subsequent penalty increase also be applied to the mythic version of the bane-effect? I’m honestly not clear on the interaction of abilities within the horn’s text, so clarification would help here. -Midnight Beacon: An intelligent item with full proper senses that may cast detect undead, desecrate and animate dead while also granting death ward to the wielder. The lantern may also generate darkness in conical spreads, deeper darkness for mythic users. In the hands of a mythic wielder, the lantern can emit a pulse that draws undead nearer and puts them under the user’s command. Nasty! -Orb of the Seventh Star: Dancing Lights, detect magic, + detect thoughts, though the latter only 1/day for arcane casters. Also, shoot up to seven sparkling stars, like magic missiles, either on their own or in conjunction with other magic missiles, in which case the action economy for adding additional missiles is more favorable. Mythic arcane casters may tap into the stars of the orb to prepare additional spell levels/spell slots, none of which may exceed 3rd level, though this uses the same resource as the missiles. Mythic upgrade is also possible. Now I like this item pretty much, but shouldn’t the max level of the spell level/ slot level scale up to 3 instead of being capped there? Not a bad glitch, mind you, but one where I can construct a cornercase that could be deemed slightly problematic – though admittedly, said case would hinge on gross violations of WBL-suggestions. Editing and formatting are very good, I noticed no significant glitches apart from the hiccup mentioned. Layout adheres to Legendary Games’ 2-column full color standard and the pdf has no bookmarks, but needs none at this length. Jason Nelson’s slotless items provide his trademark blending of high-concept style and complex mechanics and generally, this pdf’s items breathe this sense of the magical I like. However, at the same time, they do feel, at least partially, a bit heavy on the number-modification side and ultimately, slightly less awesome than some of the glorious pieces he has crafted in the past. To me, this is pretty much a good pdf – certainly not bad, but also not mindblowing. My final verdict will clock in at 4 stars. 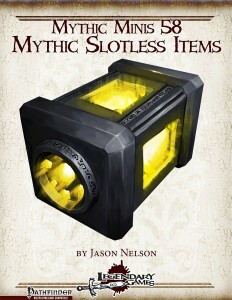 You can get these slotless items here on OBS and here on d20pfsrd.com’s shop!